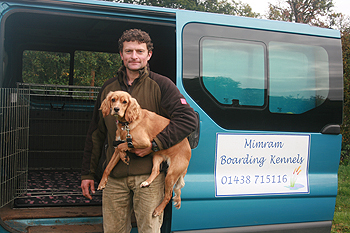 Mimram Kennels is on the site of the family home and there is a 24-hour security presence. Cameras are in operation and the kennel blocks are alarmed. Guest's pop-holes are shut in the evening and the runs and blocks are locked too. We understand that time is precious and have therefore catered for this by providing a chauffeur service, collecting and returning our guests from Mimram kennels in our securely fitted, air-conditioned vehicle. Just ask us about this service and we can let you know the price depending on where you live.